“Doris Day (born Doris Mary Ann Kappelhoff; April 3, 1922)is an American actress and singer, and an outspoken animal rights activist since her retirement from show business. Her entertainment career began in the 1940s as a big band singer. In 1945 she had her first hit recording, “Sentimental Journey”. In 1948, she appeared in her first film, Romance on the High Seas. During her entertainment career, she appeared in 39 films, recorded more than 650 songs, received an Academy Award nomination, won a Golden Globe and a Grammy Award, and, in 1989, received the Cecil B. DeMille Award for lifetime achievement in motion pictures. That’s putting it mildly. 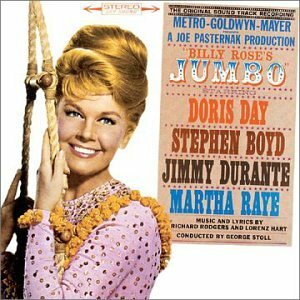 A great singer an instinctively great actress, Doris has had a hard life — despite a fantastic career. She’s now comfortably retired in Carmel California. Every year a local dj. gives her a radio salute, on which she appears to thank her legion and fans. 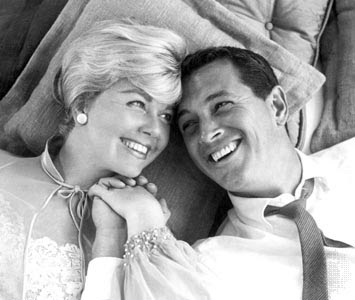 Her marriage to Jordan was the partial inspiration for Martin Scorsese’s New York New York . “To George Weidler (a saxophonist), from March 30, 1946 to May 31, 1949. Weidler, the brother of actress Virginia Weidler, and Day met again several years later. During a brief reconciliation, he helped her become involved in Christian Science. To Martin Melcher, whom she married on April 3, 1951. This marriage lasted far longer than her first two. Melcher adopted Terry (thus renaming the boy Terry Melcher), and produced many of Day’s movies. After her autobiography was published, Day married one last time.